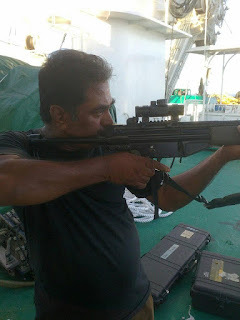 Mr. Padmakumar Madhavan Pillai is an Exserviceman.He worked as a Marine Security Professional with OMSC (Ocean Marine Security Consultant),Pattirippala, Palakkad, Kerala which is a concern with Mr. Abdul Razack as Managing Director.After completion of the job contract, six months later they didn't gave him salary. He alleges of having tangible evidence against OMSC Pattirippala, Palakkad and it's Managing Director Abdul Razack as well as Offshore Marine Security (UK), Seoul ( Korea) Managing Directors David Fowler and Nathan Whats and Operation Manager Natalie Pop. The emails trails of Indian High Commission, Seychelles ,MAH'S Island, South Africa First Secretary Mr. Sankara Subbu and OMSC Pattirippala Palakkad, Kerala Managing Director Abdul Razack,Offshore marine. Security (UK based), Operations. Control office (Seoul, Korea) are with Mr. Padmakumar and his colleague Mr. Jayalal Surendran.He claims that those emails are important evidences against OMSC Managing Director Abdul Razack. Padmakumar said,"Mr. Abdul Razack is doing fraudulent business practices in the international level.He has opened a new business called Ocean Academy for Pre-Recruitment Training at Palakkad, Shornur and Pattirippala.This organisation acts as a help desk to students interested in getting jobs at Indian Army, Indian Navy, Indian Airforce and Paramilitiary forces like CISF,ITBP, CRPF, BSF etc.I have serious doubt that people would get cheated.Actually every State would have two or three branch recruiting offices (BRO) of the armed forces.All jobseekers must crosscheck with the BROs and can visit the offices or call by phone during the office time on working days between 10 am and 5 pm.Union Government did not give any authority to start private institution for recruitment to the forces.Don't waste your precious money.All appointments would be done under the watch of government officials.Any attempt to bribe will a disqualification.Moreover , do not support corruption as it is a disease that plagues our County.JaiHind".